In the early 1990s when Nelson Mandela was released and radical change was inevitable in the RSA, many were becoming aware of the indefensible bias of the history of the country in general and how this was reflected in our monuments in particular. The Isandlwana battlefield was a telling example: the fact that memorials to British soldiers had been erected on the site, but nothing existed there to commemorate the Zulu warriors who won a decisive victory over the British in 1879 was embarrassing. 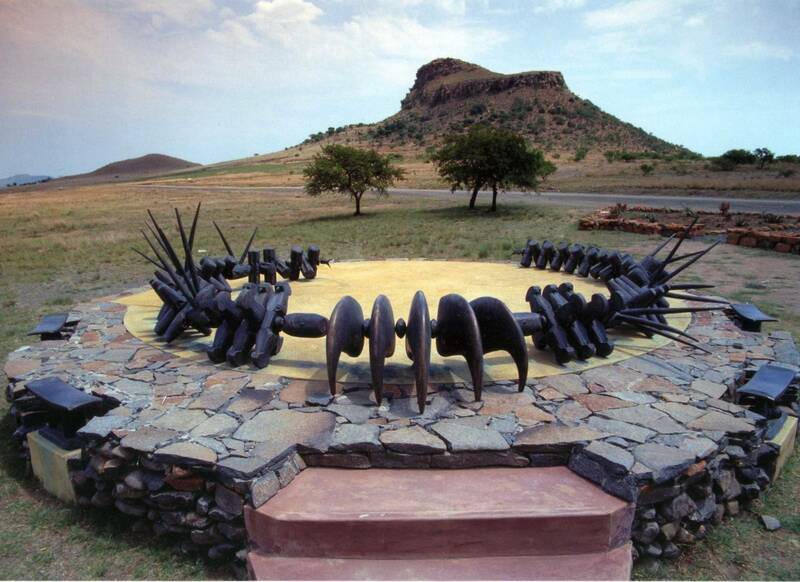 Gert had previously made a small bronze sculpture for the KwaZulu Monuments Council to commemorate an anniversary of the battle of Isandlwana. The sculpture portrays King Cetswayo not as a gloating victor, but as the monarch who, lamenting the many lives lost in the battle said, “Alas, a spear has been thrust into the belly of the Nation”. Gert was approached by the same council, now called Amafa, to design and make a monument to honour the fallen Zulu warriors, to be unveiled on the 120th anniversary of the battle. The commissioning body initially requested a frieze of traditional fearsome warriors brandishing spears. As in the case of the earlier commemorative sculpture, Gert felt that the monument should not glorify war and that the imagery should accord with the climate of change in the country and should speak of a new way of engaging the future. The “isiqu” or necklace of valour seemed an appropriate symbol: deserving Zulu warriors were permitted to wear a necklace which they generally carved themselves. Thus the main feature of the monument came to be a bronze necklace that evokes the powerful image of a warrior of exceptional bravery laying down his weapons to engage in a cathartic task of some intricacy requiring different skills and a reflective attitude. For aesthetic purposes, the stylized necklace differs from the traditional ones by the use of uncharacteristically ornate beads and the introduction of lions claws that were reserved for royalty and officials of high rank. Thorn-like spikes were included to give energy to the low-lying sculpture and because some warriors included thorns with blunted tips in their necklaces. The necklace is mounted on a circular base that symbolizes unity and is reminiscent of Zulu kraals and huts. 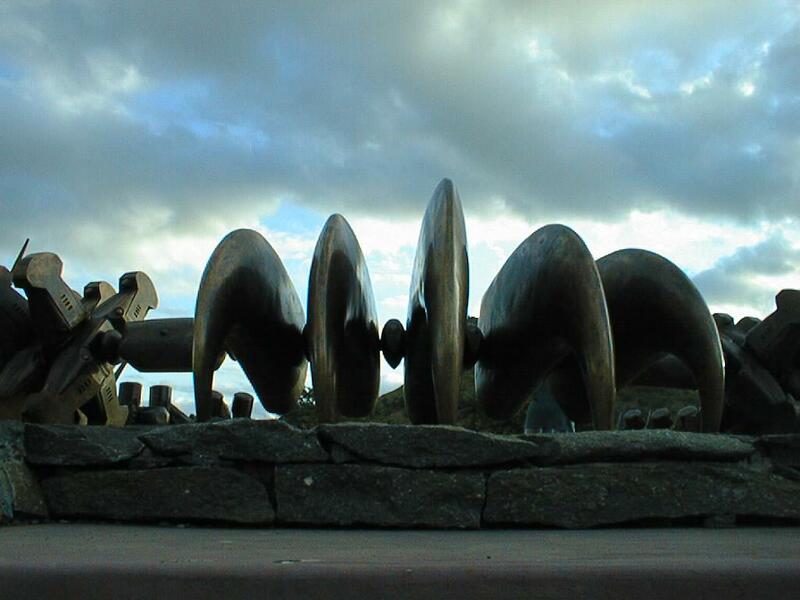 Set into the stone-clad perimeter wall of the base there are four unique bronze headrests representing the four Zulu regiments deployed in the battle. These headrests, with their obvious connotation of rest, reinforce the theme of the cessation of violence. As symbols of the departed warriors and of contemplation, sleep and the dream-world, the headrests honour the ancestors who play an important role in Zulu culture. It is customary for the souls of departed Zulus to be ceremonially “swept” to their appropriate resting places with branches of a specific type of thorn tree, a specimen of which was planted near the monument. The monument is carefully positioned on the battlefield so that it blends in with the rocky strata of the sphinx-like Isandlwana hill. Moreover, the placement of the necklace on its concrete platform simulates the movement of the regiments who attacked in the traditional “buffalo head” formation. The group of claws at the top of the stairs in the base signify the “head” or “chest” part of the formation, the main body of the warriors. The warriors in the left “horn” were engaged in heavy combat at the base of the hill. This is depicted by the inward curve of the left-hand section of the necklace. The right-hand section of the necklace opens out towards the hill, echoing the movement of the right “horn” of the warriors around it to outflank the British soldiers retreating to Rorke’s Drift. When mounting the steps the visitor is confronted with the claws that elicit acknowledgement of the dignity of the Zulu nation that was robbed of its sovereignty by the British invaders. The visitor is able to walk along the left-hand perimeter of the base and into the centre of the monument. Here, encircled by the advancing troops, he or she is invited to identify with the slain warriors and to contemplate the tragedy and futility of war. Istine Swart, Gert Swart's wife, has worked with him on a number of sculpture projects and is currently lecturing Mathematics at the University of KwaZulu -Natal, RSA. I was born 7 years after the end of WW2 in a country fraught with its own history of conflict and underlying tensions. For those, like me, who did not experience the horrors of war first-hand, it is hard to imagine the scale of such wanton death and destruction. While the atrocities directed at the majority of my fellow South Africans may differ from those experienced in a world at war, their plight and pain has informed much of my sculptural expression. For the past 20 years, I have lived and worked as a sculptor in Pietermaritzburg in a country once despised by the rest of the world for its heinous racial policies. In my lifetime I have, however, witnessed a country crippled by a despotic minority transformed into a democratic dispensation – a rainbow nation – made possible by the magnanimity of those who suffered so much: a willingness to extend an olive branch to their persecutors.